We recently had PopUp Car Detailing Brisbane approach us with a large range of requirements. They needed a new Google Ads agency and a organic seo plan. 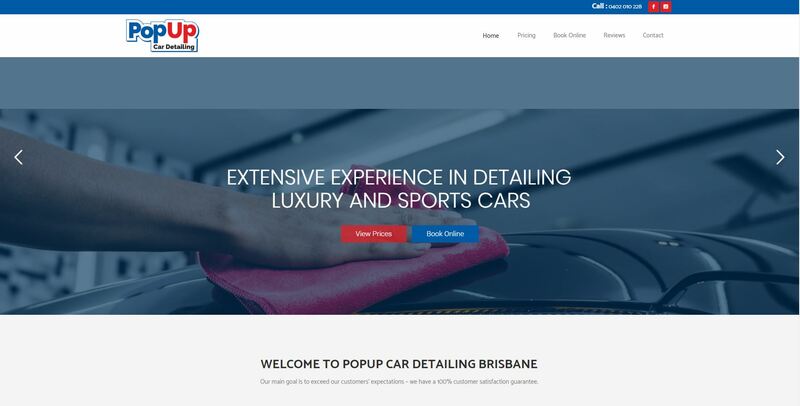 PopUp Car Detailing are a Mobile Car Detailing company based in South East QLD (Brisbane, Sunshine Coast and Gold Coast), they are passionate about what they do and their customers. We spent allot of time with their team working on a design and end goal to deliver the best possible results for them and the brand. With the SEO plan underway, their website has grown 250% in the search results with many high traffic first page results. Their google ads have gone from 2 -3 % conversion rates on average to 25 – 40% conversion rates depending on the day of the week. Cost per lead and per booking has dropped by over half. PopUp Car Detailing will come to your home or workplace. They guarantee to provide you with the world’s best in automotive detailing. Some of the services they offer are: Car Detailing Packages: Exterior Washes, In and Out, Mini Details, Full Details, Paint Correction and Protection plus more.